LAS VEGAS -- Lincoln plans to add suicide doors to a future version of the Continental sedan in a move that harks back to the nameplate's iconic past, dealers learned Saturday at the 2018 NADA show here. During its annual make meeting Saturday, Lincoln showed dealers a photo of the Continental with the rear-hinged doors and disclosed plans to build the model, according to multiple dealers in the room who didn't want to be identified. The move is part of an effort to demonstrate the brand's commitment to its car lineup. The company did not discuss timing or details about the doors. Continental sales in the United States have fallen 30 per cent through the first two months of this year from the year-earlier period. The automaker has sold just 81 Continentals in Canada through the first two months of year, down two from 2017. Lincoln resurrected the Continental nameplate in late 2016 to replace the slow-selling MKS. The vehicle marked a turning point for Lincoln. When the concept was unveiled at the 2015 New York auto show, it was the first to feature the brand's new mesh grille that has become the face of every model. "Continental is an important part of the Lincoln family," a Lincoln spokeswoman said. "We have nothing to announce today relative to any future products plans." 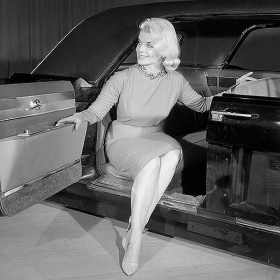 The spokeswoman declined to confirm the plans for suicide doors. Suicide doors date back to many pre-World War II era vehicles. The 1961 Continental featured suicide doors, and the brand was considering them as recently as 2007, Automotive News reported at the time. It was a source of tension among designers then. Conventional rear doors won out during the process because they were deemed more feasible for a production vehicle. In addition to the Continental, dealers saw the upcoming Aviator crossover, which will debut next week at the New York auto show. Joy Falotico, the newly appointed head of Lincoln, briefed the room on the company's plans to add the Aviator and an additional SUV by 2020, as well as four other vehicles after 2020, which it announced last week as part of a new product blitz. "The cycle plan is central to our business," Luis Somoano, chairman of the Lincoln National Dealer Council and president of Doral Lincoln near Miami, told Automotive News. "They've put a lot of investment in that." Robert Parker, director of marketing, sales and service for the brand, said the recent launch of the Navigator and upcoming launch of Aviator is helping bring new customers to the brand, which has set a goal of 300,000 global sales by the end of the decade. Lincoln sold just over 188,000 vehicles globally last years. U.S. sales fell 0.5 percent to 111,159 vehicles. Lincoln sales in Canada dipped 2.6 per cent to 8,107 vehicles in 2017. "There's never been this much investment in Lincoln's history," he said. "The amount that's going in really shows the level of confidence in the brand."